A couple of weeks ago, I was at the Ben Franklin Crafts store in Kailua for a meeting. Well, I walked by the closeout rack and happened to find a couple of my favorite brand punches on closeout and knew I had to grab them. I finally got the Fiskar's "oval and oval again" punches in two different sizes and had to make something with it. 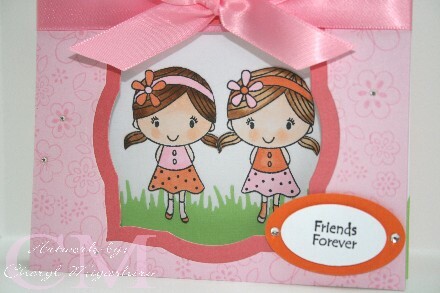 I used a Spellbinder's nesties to cut the center of my card and decorated the inside with these girls from Hero Arts called "sweet wonderful you". 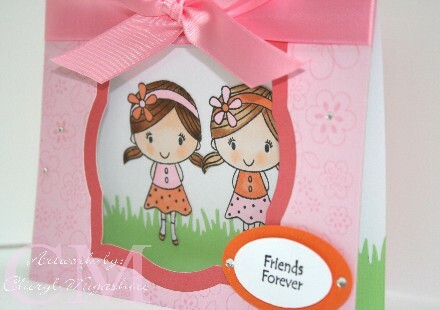 I stamped the background of the card with a Hero Arts cling stamp called "flower wallpaper". All inks used were Memento inks from Tsukineko. Tomorrow, I'll show you what I did with the center piece that I cut out with the nesties die. I didn't want to waste it. Thanks for stopping by today and I really appreciate all the sweet comments that you leave me. So cute, love the adorable images, and like the way you did your layout. I think I may have to "case" it! Hi Cheryl! Your card is so cute! Luv the image & the layout! Cute card, Cheryl. Luv how you added the grass to the card - I think that's next on my to-buy list. this is so cute for any occasion! love the two girls...they are so sweet! great card and love the sentiment =) hope you have a wonderful weekend! oh and yes you can post the cards on the blog if you wish...thanks! This is such a cute card! Love the way you cut out the center. I still have to try that out. It was great to finally meet you.